If you get the flu, you may assume that you’re down for the count and just have to wait it out. A medical doctor may prescribe an antiviral medication, such as oseltamivir (Tamiflu), if you talk to him/her within 48 hours of your symptoms starting. That’s the window when the drug should be started for it to be most effective, which means lessening fever and symptoms and shortening your illness by about a day. But even in the midst of misery, you can start a bounce-back program—therapies designed to hasten your recovery from the flu beyond what you can get from over-the-counter pain and congestion medications…and speed your body’s overall healing by boosting your immune system. • Drink flu-fighting tea. A tea made from equal parts elder (flowers and berries), linden and chamomile has antiviral properties and is relaxing to the mind and body. Steep two teaspoons of the mix in eight ounces of water, then strain. Drink five cups per day (as hot as you can tolerate to encourage blood flow to your lungs) and preferably 30 minutes before or after meals. 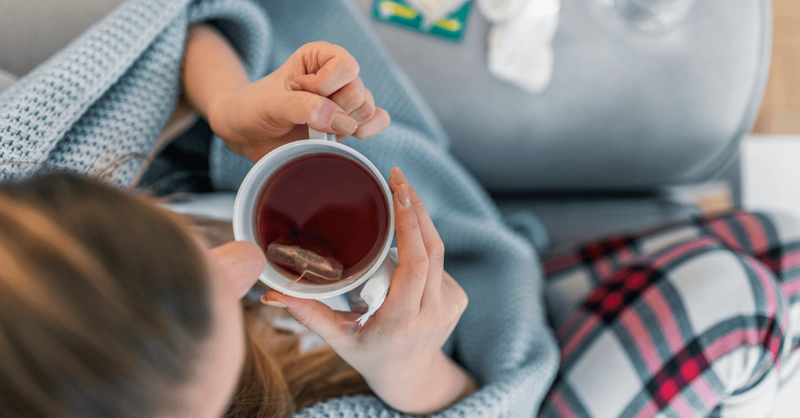 If tea is not available, take one-quarter teaspoon of a tincture of one or more of these herbs in a cup of hot water four times a day during your illness and for a few days afterward. • Try homeopathy. To shorten your recovery time, take two pellets of homeopathic Influenzinum 30 C, twice a day for three days while you are battling flu symptoms. Put the pellets under your tongue and let them dissolve. Take 30 minutes before or after eating. Influenzinum sparks an immune response to the flu virus. • Add an adrenal-boosting regimen. When you are really sick, your body uses lots of cortisol, a stress hormone that helps defend against illness and restore well-being afterward. Depending on your health, your age and the severity of the illness, supplies of cortisol can run low during a bout of the flu. That’s why my bounce-back protocol includes adrenal support—herbs and nutrients that help your body produce cortisol. For this, I often prescribe vitamin B-5, also known as pantothenic acid (250 mg, twice daily with food)…vitamin C (1,000 mg, twice daily with food)…and a tincture of Panax ginseng (one-quarter teaspoon in two ounces of water, twice daily, 15 minutes before or after eating). I recommend taking this regimen throughout the course of the flu and for one week after your symptoms subside. • Get moving! When you’ve just come down with the flu and have a fever and significant pain, get your rest. But as soon as these symptoms pass—even though you may still be sniffling, tired and suffering from stiff muscles—try to take a short walk outside to get a few deep breaths of fresh air. If possible, do this every two to three waking hours. If you have chronic lung disease, use caution—cold air can cause shortness of breath. Gentle walking promotes circulation, and deep breathing increases the amount of oxygen that fuels your body. Be aware: The flu often causes muscle weakness, which can linger following the illness. Pay attention to your balance and muscle strength, and take precautions, if needed. Important: If you have the flu and develop a high fever, painful cough or shortness of breath, see your doctor right away. The flu increases risk for pneumonia, which can be deadly. * Talk to your doctor before trying these remedies if you have a medical condition or take medication.